Where have I seen that profile before? That's right. 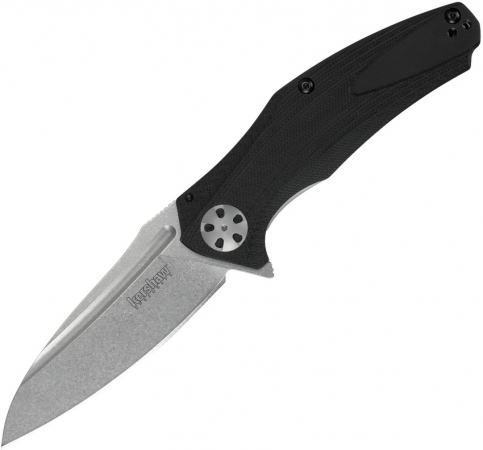 The Kershaw Natrix is based on brother brand Zero Tolerance's 0770, which itself was inspired by the award-winning ZT 0777. The design has - apparently - been the envy of certain other knifemakers. And now we're taking it back. Kershaw's Natrix features a drop-point blade of 8Cr13MoV that offers solid performance with good edge-holding and easy resharpening. The stonewashed blade finish looks good and even helps hide use scratches. Accessed with the built-in flipper, makes it easy to open the Natrix one-handed so it's always ready when you need it. The handle is lightweight G-10, 3D-machined and chamfered to fit comfortably in the hand. An oversized pivot provides an attention-grabbing detail on the front of the knife, while our patented Sub-Frame Lock secures the blade and provides a dramatic, contrasting line on the back. The Sub-Frame Lock design also enables us to lighten the weight of the Natrix, so that you get a big, useful blade in a knife that still weighs in at a mere 2.9 ounces. A decorative aluminum backspacer lightens the load even further and adds another embellishment. Finally, a custom-designed deep-carry pocket clip echoes the lines of a special recess machined into the handle to complete this good-looking knife. Now the next time you see this famous knife profile, it will be from a manufacturer that has a right to the design: us.